Blackjack is the most widely-played casino game in the world. This article will explain how to play and provide basic rules. The house is represented by a dealer, who deals two cards to each player face up. The first of the dealer’s two cards is placed face up, the second face down. Number cards take their face value. Jacks, Queens and Kings (the picture cards) take a value of 10 and Aces take a value of either 1 or 11 depending on player’s choice. Hit: Take a card, no additional bet required. Stand: Take no further cards, no additional bet required. This ends the player’s turn. Double: If the player’s total is 9, 10 or 11, the player can double their bet but will only receive a single card before their turn ends. Split: If the player’s first two cards form a pair, these cards can be split to form two separate hands. The player must match their original stake for the second hand, and the two hands resolve separately. Contrary to popular belief, the aim of the game is not to get as close as possible to 21. The aim is to beat the dealer, either by being closer to 21 or by not going over 21 (“busting“) when the dealer does. Once a player busts, their turn is over and their bet is lost. Players can hit as many times as they like. 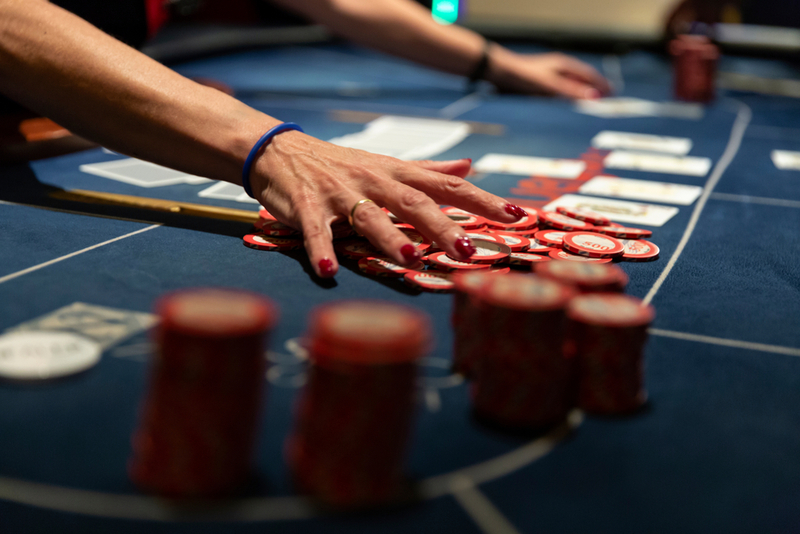 Once the player’s hand is resolved – by standing or busting – the dealer moves to the next player. Once all of the players’ hands have been resolved the dealer reveals their second card. A hand of an Ace with a 10 or picture card (i.e. totalling 21 immediately) is called a ‘Blackjack’, even if the Jack of Spades or Jack of Clubs are not present. If the dealer’s visible card is a 10, a picture card or an Ace, play continues. If not, the dealer cannot match the player’s Blackjack and will pay the player’s winnings immediately. Players play against the dealer and not each other. Once all hands have been resolved, the dealer announces the results and all remaining bets are won or lost accordingly. Tied scores are known as a ‘push’ and the player keeps their original bet. The main Blackjack rules place restrictions on how the dealer’s hand is resolved. In simple terms, the rules take away any element of choice on the part of the dealer. Players can stand on any score. Dealers must continue to take cards if their score is 16 or lower. Once the dealer’s score reaches 17 or higher, or the dealer busts, the hand is over. Some casinos require a dealer to take a card if their score is 17 including an Ace (known as a ‘soft 17’). Casinos shuffle together a number of standard 52-card decks to form a ‘shoe’. The number of decks in a shoe varies, but is normally between 4 and 8. Blackjack is the only major casino game in which what has been seen can influence what is to come. For this reason, Blackjack strategy is underpinned by mathematical probabilities. Players don’t need to be geniuses; a couple of hours of study is all that is needed to get started because the statistically-correct decision in every possible scenario has already been calculated. One of the main attractions of Blackjack as a casino game is the low house edge – the statistical advantage built in to each game. The house edge in roulette is at least 2.7% whereas the edge for Blackjack can be below 0.5%. Learning exactly when to hit, stand, double or split can reduce the house’s edge to almost zero. Although online Blackjack is similar in many respects to playing in person, there is at least one difference that can make it less attractive. In a casino, dealers shuffle the cards only once the shoe is empty. Online, the computer dealer shuffles the cards after every hand. This means that what you have seen in previous hands no longer affects what you will see, and increases the house’s edge. However, it does not affect the mathematical probabilities so only increases the house’s edge very slightly.